It's been a while since I last posted anything about food. To be honest, I have tried a lot of food especially that Christmas season just ended. I am a bit sad not sharing them here. 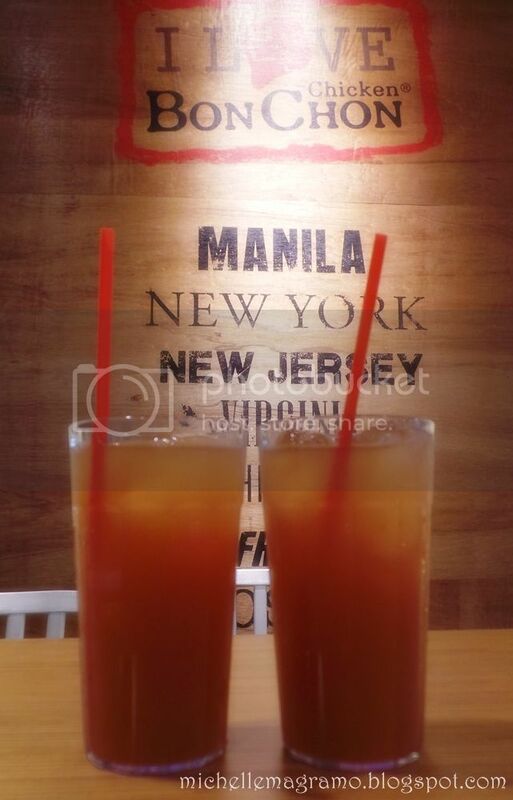 But, to make up for that, here's a post about the much hyped fast food in town lately which is BonChon. I love viewing Instagram photos as I find them very entertaining. 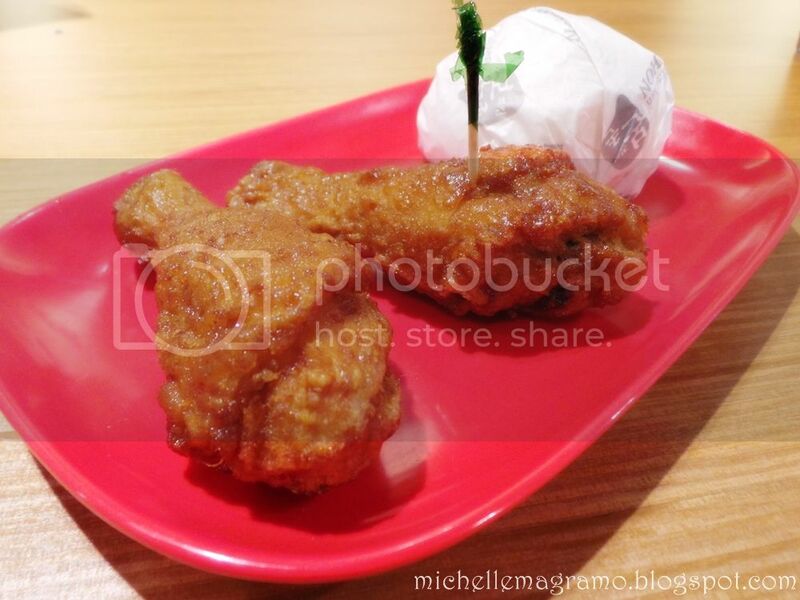 Curiosity hit me when I saw a lot of good photos showcasing BonChon's chicken. BTW, my Instagram account is michellemagramo if in any case you would want to follow me. 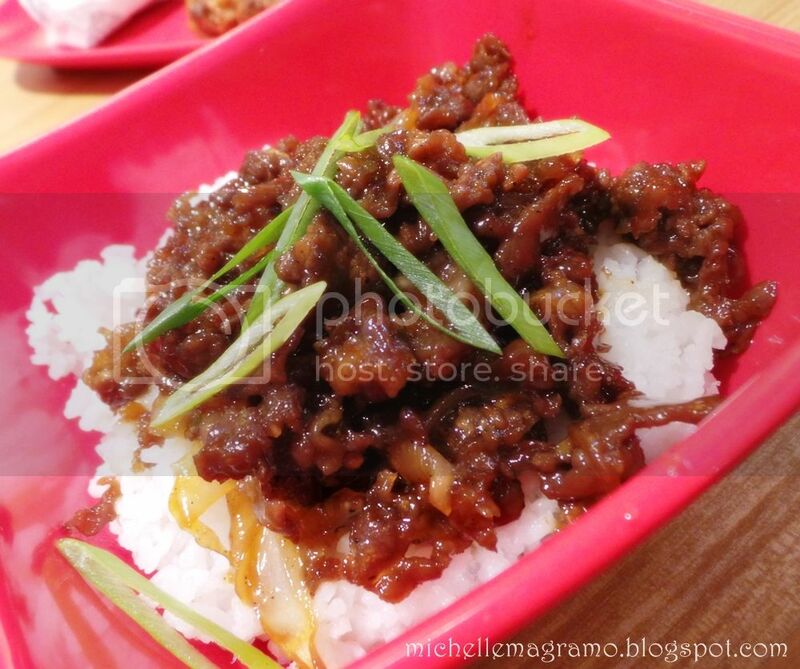 My first try was at BonChon Katipunan and it was not good. The place was crowded and the chicken was just okay. Tasty on the outside but bland on the inside. So my curiosity ended there until they opened another branch near my place which is the one at Sta. Lucia East Grand Mall. My boyfriend and I gave it a second try and this time, we ordered other dishes as well. First, the Drumsticks Rice Box. One was flavored soy garlic and the other one is spicy (the one with toothpick). Again, nothing has changed with the taste of their chicken. The skin was flavorful and the meat was, ah never mind. I find the spicy flavor too strong and you can't really enjoy the food anymore. All I felt was pain on the tongue. I love spicy food but I will not include this. I hope they lessen the spiciness, soon. Next, is this Beef Bulgogi Rice. We asked for extra beef because my boyfriend is addicted to anything that has beef on it. I think this is quite pricey for its serving but since I find this more pleasing to my taste buds, the price is justified already. The meat is tender but if you're the type of person who isn't a fan of sweet main course, this one is not for you. Last but definitely not the least, MY FAVORITE, Fish and Chips. The fries were salted just right and you can taste the skin of the potato as well. My kind of fries! The fish, on the other hand is my favorite out of the bunch. With this, you won't taste any unsavory taste. You can sense the texture of the fish but the taste is fresh and savory. If you are going to order this, again, choose SOY GARLIC. Overall, BonChon chicken isn't my favorite. The fish fillet is the winner for me. I love it and I can have it everyday. Not shown here is the Chops Rice Box which I find better than the fried chicken. 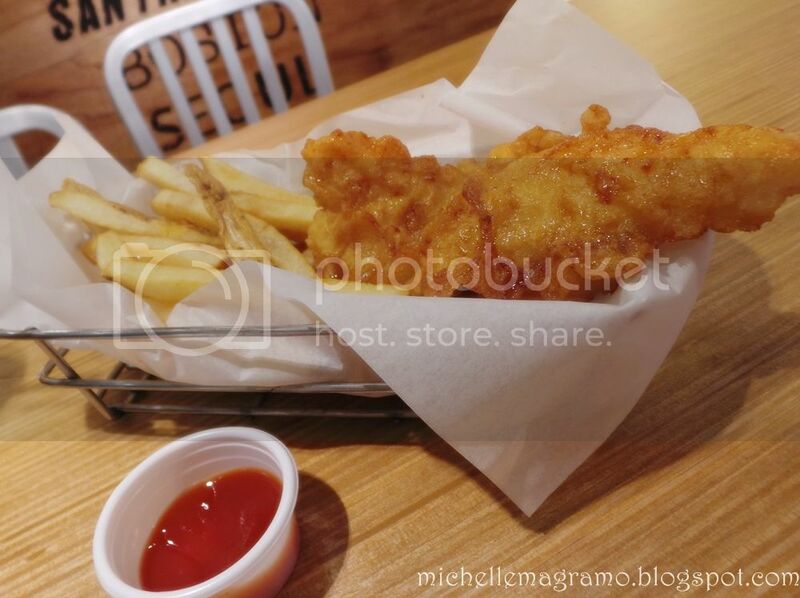 It is chicken breast fillet that is deep fried. You can taste more flavor with that but it's a tad drier. For more information about BonChon, visit their Facebook page here. if you liked their fish fillet you should definitely try their fish taco. perfect for on the go, though you might want to be careful with the dressing :) I eat at BonChon regularly mostly for their SQUID Rice Bowl (not sure if that's what it's called exactly. I don't wear my glasses when I order so I can't read it lol. I just point and grunt hahaha). The squid is so flavorful, perfectly cooked, plus the garlic soy breading does wonders with the rice.